It has been said over and over that social media is not advertising, but if you look closely at a number of brands in the region, they're still trying to sell, sell, sell. Yes, your end game is to sell your product or service, but you just can't get there via the hard sell immediately. The whole social media brand policy should be about building meaningful (and rewarding) relationships first. When you have a genuine following (remember, not large, but genuine), you'll start seeing business results – when fans like what you say and do, they appreciate what value you bring to the consumer and customer, and they identify with your product, your service, your actions – and your brand. Brands need to stop using social media like a tv channel and treat it more like a person to person conversation. With genuine, shared interests. The first step is to find out what fans think about your brand, what they say about it, how they react to what you say. And where and when are they having that conversation. For it to be meaningful, you don't need to be on every channel, but you need to have the right context and right content every time. It's really like an interesting conversation – you need to follow what the other person says, figure out what he/she is thinking, thinking about what you say, how you say it, and when. Social is no different. Start by listening carefully. Remember, God gave us two ears and one mouth for a reason. How much does a consumer know about your brand, your product, your offerings? How do they perceive it? What do they think about your competitors? Do they have positive or negative perceptions about you? You can't do this once a month – listening has to be done in real time, so you can build your conversation – and thus your relationship around it in the here and now. Creating inspired (insight driven) content is key. There are numerous social monitoring tools out there. Some are simply listening tools, some have an added analytics layer, and a few will actually let you participate in dialogs through their dashboards. Mention, is one such tool. It even allows you to participate and engage outside your owned social gardens – like answering a query posted not on your facebook page, but on Quora. Build your content based on deep insights. Insights about what your audience wants to read, here, find out, share and are ready to amplify because it truly resonates with them. That doesn't happen with selling. Consumer and customer based insights help you build relationships that are meaningful and will achieve your goals. Selling a bar of soap isn't a goal. Getting someone to really like that bar of soap is. 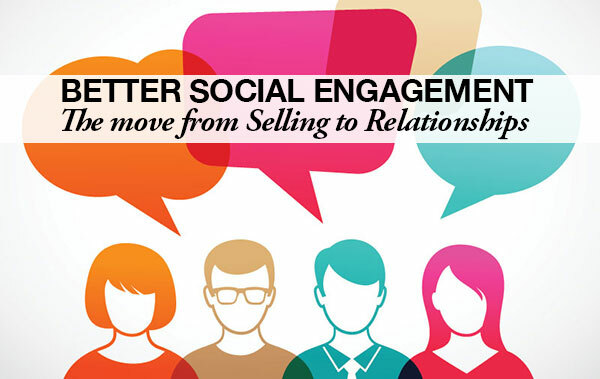 Social media engagement is dependent on on going relationships with your brand. There's no better way to nurture and build that relationship than using your social channels for meaningful customer service. Even your target audience (not your customer yet) will react positively to social customer service done right. Having genuine conversations about user needs, problems, queries, complaints in real time is unique to social. You just can't do that on tv or a newspaper ad. So, use that golden opportunity. Social media strategy that recognizes this, invests time and effort in it reaps the reward of true engagement. It is the here and now possibility that's key – and with CRM, why would you stick to the old direct mailer, the email, or a 800 number only? Timeliness, social awareness (listening, remember? ), and the agility of responding with true passion and effective handling of a customer need is what matters. After all, most people use social media to resolve an issue. That may be about looking for value, for entertainment, for information, for motivation. Stop selling product. Start offering resolution. And move to building relationships. This is a great post. I've enjoyed reading some of your other posts as well. Thank you. When you mention brands in the region, you probably talk about where you are – which I figure is the Middle East. You will be surprised to know that the same holds true in almost every market. A lot of smaller brands here, including entrepreneurs here in the US, never realize that social media is really not a classifieds ad. Which is why they are busy selling, and not creating conversations. They wonder about social media ROI, but never admit they don't spend time on developing relationships, as you said. I don't think you can "Improve your social media engagement" from zero. Most people don't even have a starting point. I agree with what your post says, but a better post title would have simply been "Move from Selling to building Relationships" That to me is key. We often forget the importance of not trying to be persuasive sales people on our social media as companies. Even social media agencies ignore the fact that engagement is important, and follow the client brief to push the product. We really need to re-define how social media is measured up, and how we look at the way we use it simply to use it as yet another advertising channel. Nice Article Digital marketing is the process of promoting brands or products using electronic media mainly on internet.Digital marketing includes SEO,SEM,SMO,SMM etc.